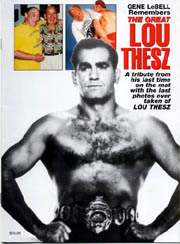 A tribute from his last time on the mat with the last photos ever taken of Lou Thesz. This full color booklet is 16 pages in length and features Lou Thesz demonstrating wrestling technique on Judo Gene LeBell. The booklet also features brief commentaries and credentials of the careers of LeBell and Thesz.